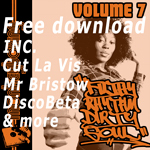 So there you are, listening to some rare-as-buggery funk/soul/jazz/ Latin track from back in the day on uploaded to Youtube but with crappy audio and wishing someone would re-press it to vinyl and, even if they did, if this section here were extended or if that soul tune was done in a Latin stylee and you’re thinking – hey, producers do edits of stuff like this for precisely those reasons. Then you think – sod edits – I’m a musician! I don’t need to edit. I can re-play – and get my mates from The Bamboos, The Putbacks and Hiatus Kaiyote to help me! 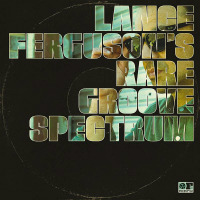 Step forward Lance Ferguson (for it is he) with new project Lance Ferguson’s Rare Groove Spectrum on which he re-creates, ‘tweaks’ and otherwise ‘remixes’ hard-to-find rare groove cuts with a live band. If you caught the sampler, you’ll know one of the cuts in question was the M&S Band’s monster funk bump, Egg Roll now extended to more than a minute longer than the original. Also making an extended appearance is a fairly straight version of Earth Wind & Fire’s Brazilian Rhyme though this opens with a drum break rather than with the minute or so of vocal guffing about like the original – oh and a samba makeover of James Mason’s spacey seventies soul Sweet Power Your Embrace. Best cuts include the aforementioned Egg Roll, an extended version of Leo Acosta’s Noches De Viaje, a blistering heavy funk take of The Panther and a gloriously summery That’s Nice, which is indeed, nice.